August 2018 | Bloomfield Cooling, Heating & Electric, Inc. Standby generators are the gold standard for emergency electrical power for your home or small business. When there’s an outage, the generator kicks in automatically and provides service for hours or days, energizing your fridge, phone and all your essentials. It will do the job whenever you need it—if you do your job to maintain it properly. Once a standby generator is permanently installed in your yard, it will last a long time if well-maintained, potentially 20 years or more. The self-testing feature is a primary reason these generators are so reliable. Each week, the standby generator turns itself on for about 10 minutes, based on a programmed schedule. The day and time can be set from the control board, and for convenience, your installer can program your unit to run self-tests weekly, bi-weekly or monthly. Any problem that’s detected is read by a remote indoor monitor that transmits data to your maintenance team, who will determine if your generator needs service. Also important: the test charges the 12-volt car battery the generator uses so it’s ready to go the moment a blackout occurs. Most generators are relatively quiet during the self-test, like a car idling in your driveway. Some of the best standby generators on the market, like the Generac Guardian series, have recently been enhanced to further lower the decibel level. Be sure to listen for and monitor the results of these exercises. You can also read the display inside your generator to gather all the data points from the last test run. Another simple visual inspection: check the external indicator light, which should be green if it’s running properly. Red indicates an operating problem and requires a service visit by a certified technician to keep the warranty intact. If you’re away from home, don’t worry. The Generac Guardian series and other top-of-the-line generators have remote Wi-Fi monitoring capability. Weekly data results can be transmitted to a smartphone, tablet, or PC. Monitor oil levels monthly, or more when the generator is running for longer periods of time; be sure the breaker and unit are off before pulling out the dipstick. Oil levels are key to maintaining the warranty. Keep the area around the unit clear and easily accessible, especially near the intake and exhaust areas. The generator needs air to work properly. Leaves, snow, or nesting birds and animals can all interfere with operation. For ultimate peace of mind, Bloomfield Cooling, Heating, & Electric, Inc. offers a preventive maintenance contract, which ensures inspections are done correctly, thoroughly, and on time. 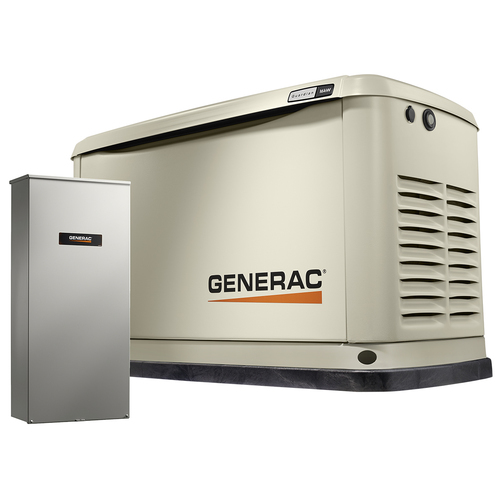 We are a factory authorized dealer for Generac and offer certified service for Generac and Honeywell generators, the industry’s leading brands. Your work is always performed by certified technicians from a multiple-award-winning HVAC company. Check our website to read about standby generator and our latest generator maintenance specials; then call us at (973) 237-0505 to set up your appointment or for more information.